Select Ira / Tira driver from the Process Plugins section. Right Click on the icon and select Configuration. 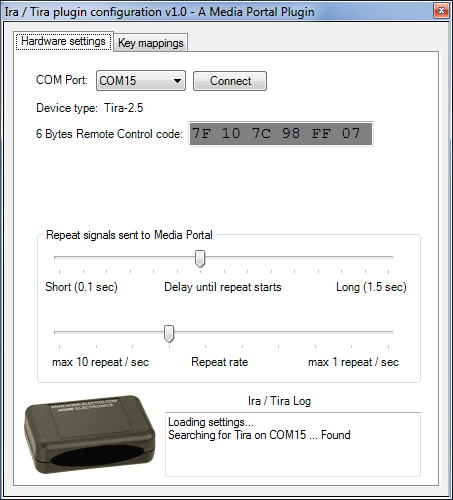 Select COM port which your device connected to.If you are unsure about the port you can try one by one using the connect button. Hold down an arbitrary button and set repeat delay and repeat rate like you would set it for your keyboard. Select Key mappings tab on the top of the configuration window. Select a media portal command from the list. If the command you selected is already mapped to a remote code then it is displayed in orange, the corresponding remote code is shown beside the command and the Map! button changes to Clear so you can unmap the command before assigning a new remote code. 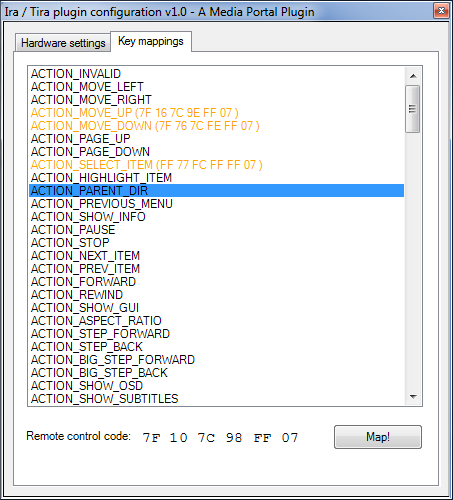 Press a key on your remote control.The remote control code is displayed below the command list. Press Map! button to assign a Media Portal command to the button you pressed before. Repeat steps 7 - 9 for each command you would like to use.